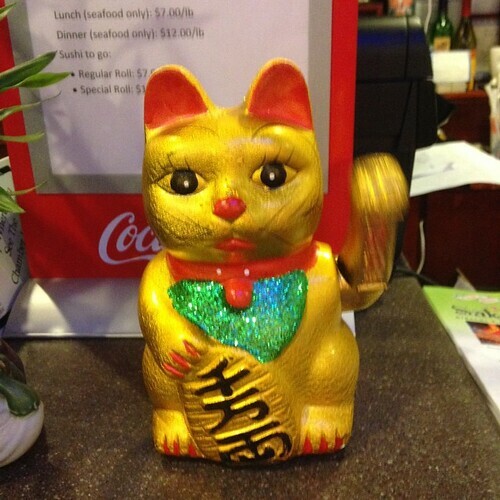 I'm not sure why but I'm obsessed with the golden waving cats at Chinese restaurants. What do they mean? I don't even know. I don't want to know. Except of course I do want to know so I looked it up. So they aren't Chinese but they're Japanese. They're called Maneki-neko. They're good luck charms according to the wiki, and the different colors are meant to have different sorts of luck attached to them. Gold is good luck for money. They aren't waving, but they're beckoning - to welcome you. The complete wiki is here, I don't vouch for it's veracity but I consider at least partially informative. What I took away from this is this - it's something not to believe in. It's a wish of good luck and good fortune. It's a hope for better things, for protection, a talisman as it were. They're such a simple thing. People don't worship them, but they place them in hopes of good things and hey - they're cute. The original story of a waving cat as distributed in Goutokuji temple cat statues shop: The story of a Monk and a waving cat: A long time ago when the temple was a shabby hut and the Monk could barely live on the small income he gained as practicing mendicant. He had a cat and cared for it like his own child, sharing his own meal with it. One day he said to the cat, "If you are grateful to me, bring some fortune to the temple." After many months, one summer afternoon, the Monk heard sounds around the gate, and there he saw five or six samurai warriors on their way home from hawk hunting, approaching him and leaving their horses behind. They said, "We were about to pass in front of your gate, but there a cat was crouching and suddenly it lifted one arm and started waving and waving when it saw us. We were surprised and intrigued, and that brought us to come here to ask for some rest." So the Monk served his bitter tea and told them to relax. Suddenly the sky darkened and heavy rain began to fall with thunder. While they waited a long time for the sky to clear, the Monk preached Sanzei-inga-no-hou (past, present, future reasoning sermons). The samurais were delighted and began to think about converting to the temple. Immediately, one samurai announced, "My name is Naotaka Ii. I am the king of Hikone, Koshu prefecture. Due to your cat's waving, we were able to hear your preaching. This has opened our eyes, and seems to be the start of something new. This must be the Buddha's will." Soon after they returned home, Naotaka Ii donated huge rice fields and crop lands to make the temple grand and generous as it is now. Because of the cat, fortune had been brought to the temple. Therefore, Gotokuji is called the cat temple. The monk later established the grave of the cat and blessed it. Before long the statue of the cute waving cat was established so that people might remember the episode and worship it. Now everybody knows the temple as the symbol of household serenity, business prosperity, and fulfillment of wishes. We all need beckoning cats.